Zinnia grandiflora is also known as Rocky Mountain zinnia, plains zinnia, or prairie zinnia. I took this photo late last August in UBC’s E. H. Lohbrunner Alpine Garden. I wanted to feature something from UBC Botanical Garden, and settled on an older photo as most of the flowers I’ve photographed at this time of year have been written about previously, like Eranthis hyemalis and Galanthus nivalis ‘Viridapice’. To follow what else is in bloom in the Garden, several people post updates to the Talk About UBC Botanical Garden forum. According to Flower Breeding and Genetics (Neil Anderson, ed. ), Zinnia belongs to the tribe Heliantheae within Asteraceae, and consists of 19 species of annual herbs or perennial shrubs. The centre for diversity of the genus is Mexico, with species mainly distributed throughout North America. One exception is Zinnia peruviana, which has a native range from Arizona to Argentina. Many annual zinnias are cultivated for use as bedding plants and cut flowers. Linnaeus named the genus in honor of German anatomist and botanist, Johann Gottfried Zinn (1727-1759). Zinnia grandiflora is a perennial member of the genus. Plants grow in small mounds low to the ground, spreading vegetatively by creeping rhizomes. 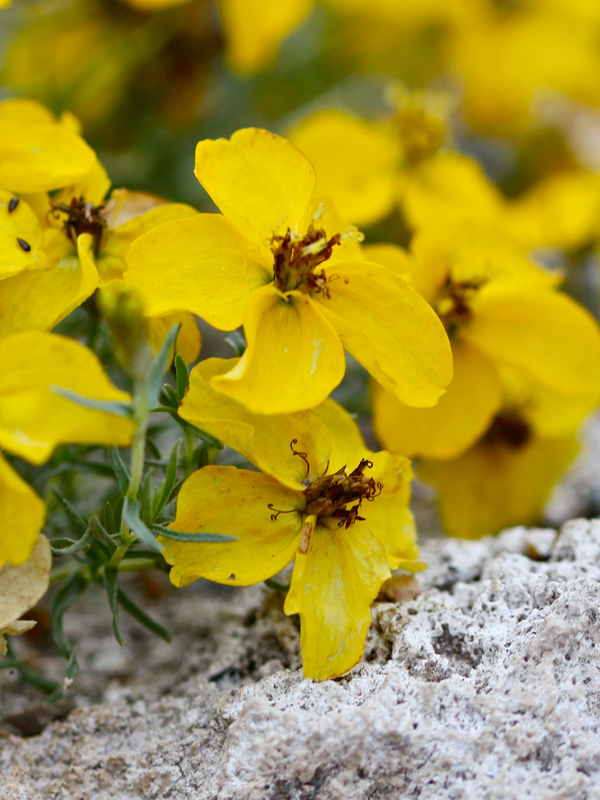 Yellow flowers cover the mat of needle-like leaves when it’s in flower. Thriving in gravelly soil without much need for water, this species is found growing wild in the southwestern United States and northern Mexico. Goodness! I was expecting something like the garden zinnias I know, and this is so different! How nice to see something blooming there when we are just about snowed in in the Adirondacks. Nice, and I think much nicer than the Zinnia cultivars. I never would have guessed these were Zinnia or even Asteraceae – I was distracted by there being just four petals, but I see lots of photos with four petals and lots with five. Thanks for the link to Taisha’s flickr photos. Leave a Reply to Wendy Cutler Click here to cancel reply.